The ViArchive solution makes it fast and easy to upload, archive, search, view and retrieve video files. ViArchive enables cutting clips and transcoding to various formats. You save time in retrieving and selecting clips, and in transferring clips between the editing machine and the archive. ViArchive can be integrated with image archiving solutions for complete, advanced solutions covering images, video and other file formats. The client side of the ViArchive solution is available as a web component (i.e. plugin for Image archives) and as a desktop application (ViArchive XPRESS). Provides your server archive with indexing, streaming and transcoding abilities. Includes a metadata and indexing engine, proxy and streaming, and a transcoding engine. The plugin version of ViArchive supports users of image archives by providing the possibility to view video, add metadata along the timeline and download original clips. ViArchive XPRESS is a powerful desktop application for uploading of videos and segments to video archives. It allows users to prepare clips for upload by adding metadata and cutting and transcoding. A map module accommodates GPS tagging of videos along the timeline. It also provides local archiving functionality, as well as allowing searching and organizing server archives. 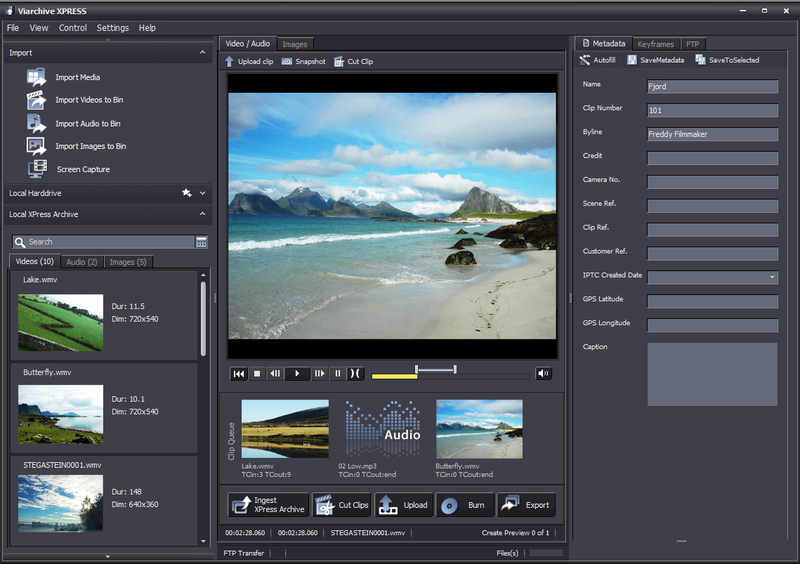 ViArchive is a video-archiving software provided in several scalable variants; from single standalone solutions for Standard-Definition (SD) format to larger more advanced systems for High-Definition (HD). Visit our product pages at www.viarchive.com to find out more about ViArchive or contact us for more information.